Staples’ Evan Zinn, left, consoles teammate Matthew Bigood in the moments after the Wreckers’ 11-10 overtime loss to Fairfield Prep in the Class L boys lacrosse state tournament in Westport on Wednesday. 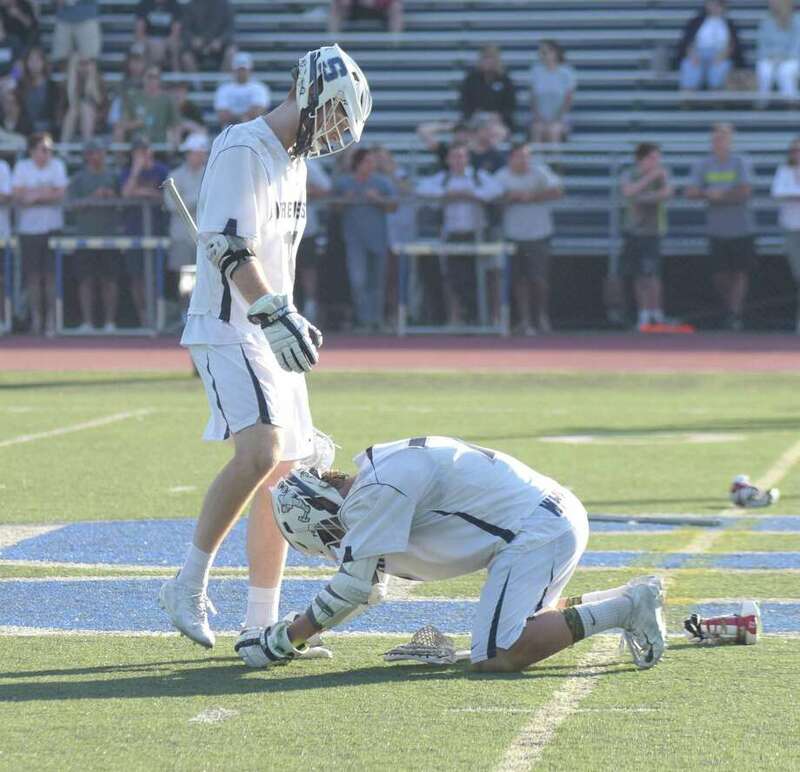 WESTPORT — A Staples lacrosse coach is accusing Fairfield Prep fans of crossing a line from cheering to anti-Semitism at a tightly fought playoff match this week. According to Staples High School lacrosse coach, fans of the visiting Fairfield College Preparatory School team, referred to collectively as the Bomb Squad, repeatedly yelled anti-Semitic chants when one of his Jewish players scored, held up a sign he believed referenced male genitalia and were apparently seen urinating on the high school and on cars in the parking lot outside the field. “This is my 10th year at Staples. There’s nothing wrong with chanting, but that’s the first time it’s ever been like that — pointed at an individual and his religion,” Staples Coach Paul McNulty said on Friday. Roz Koether, co-president of the Staples Lacrosse Booster Club, was sitting at the scorer’s table, across the field from the Bomb Squad. From her seat she said she also heard the students singing “The Dreidel Song” and chanting “We have Christmas,” when Jewish players had the ball. Fairfield Prep is an all-boys, Jesuit preparatory school located on the campus of Fairfield University. “Unfortunately, the outstanding efforts of the student-athletes on both teams were overshadowed by the behavior of some of our students in the Prep Bomb Squad cheering section,” Perrotta wrote. “There is simply no place for cheers that signal out a member of the opposing team for ridicule or boorish cheers that serve to demean the dignity of our opponents or their religious beliefs. Such behavior is clearly antithetical to our mission statement that espouses to uphold the dignity of each individual, embraces diversity, and instills a sense of social justice as a transformational means of addressing the social inequities in society,” he said. Perrotta said in the letter he had addressed the events of Wednesday’s game with the student body. But McNulty felt the actions of the students were more than “boorish.” They were anti-Semitic, McNulty said, in a response email addressed to Perrotta on Friday. Perrotta did not respond to request for comment on Friday. McNulty said Staples Athletic Director Marty Lisevick is reviewing security footage from the day of the game of students who urinated in the parking lot and on the school, as reported by an eyewitness. The sign, allegedly depicting or referencing male genitalia, was taken by a Fairfield Prep teacher, McNulty said. “Those are the only incidents we’ve had like this ever,” McNulty said. “This goes beyond school rivalries. Bigotry is a whole other level,” Koether said.